Sometimes, there’s more drama offstage than on. I’m going to wager that his thoughts, had we filled in the words instead of a lingering ellipsis, would have been something like this. The only thing that separates the douche from his wife is his total lack of morality and potentially the distance from his house to the bar you have met him in! Both my wife and I are open (polyamorous). We have joint profiles on OKC and link to each other so people know and understand. You won’t believe how many guys (and a few ladies) assume that because we’re open that “it’s ok to cheat”. 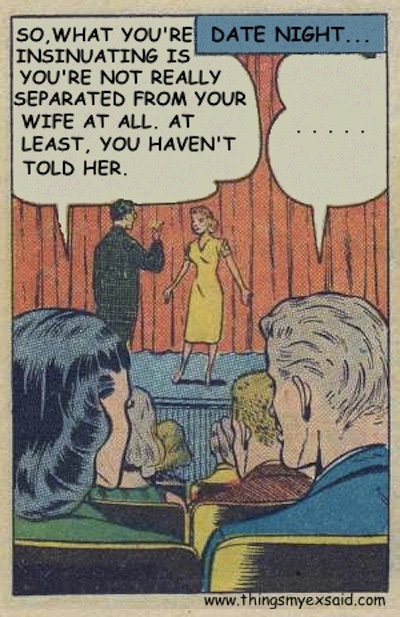 Our #1 rule… your spouse doesn’t know, you’re outta here. Rule #2… “Oh, they’re aware? Good, you won’t mind us talking to them would you?”. Rule #3… “Oh, she knows but she doesn’t want to know” doesn’t fly. See rules #1 and #2!